A similar necklace is in the museum of the monastery of Santa María la Real de las Huelgas in Valladolid, Spain, founded in 1300; see Franco Mata 2001, p. 219 and Franco Mata 2005, fig. 42. The nuns in the monastery are from the Cistercian Order, and wear white tunics. A seventeenth-century painting shows a noble lady surrounded by Cistercian nuns or abbesses wearing such jet necklaces resting on the shoulder and hanging down to the waist (Franco Mata 2001, pp. 215 and Franco Mata 2005, figs. 32, 40, 41). Cf. also a related necklace and heart-shaped pendant in the Instituto de Valencia de Don Juan, Madrid (Franco Mata 2001, p. 217 and Franco Mata 2005, fig. 22). Such necklaces were worn by abbesses (see no. 23). 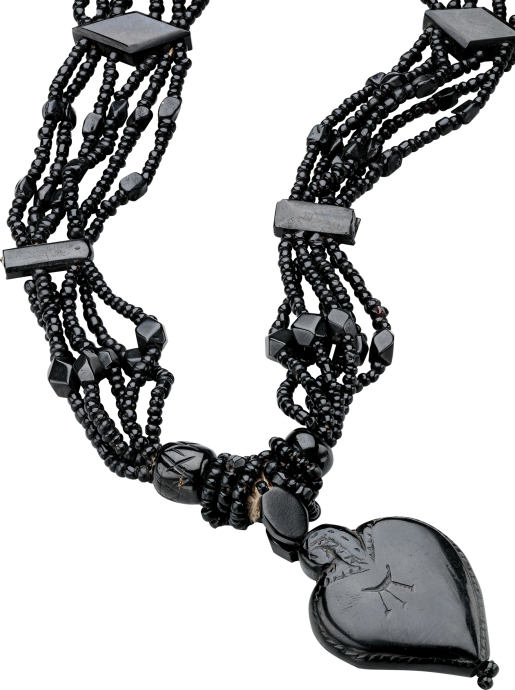 A related necklace is in the Instituto Valencia de Don Juan, Madrid (exh. cat., El arte de la plata y de las joyas en la España de Carlos V 2000, no. 104). In Spain, mines of jet (azabache) are located around Villaviciosa, in the region of Asturias, and jet stone was considered to be a precious material. Noble ladies and abbesses wore jet necklaces, and items made from jet are mentioned in inventories and in Spanish literature of the sixteenth and seventeenth centuries. For the history of jet, see Proske 1966, Muller 1987, pp. 101 12, Franco Matta 2001, and Franco Mata 2005. The Order of Santiago was a Christian military organization founded in Spain about 1160 to fight the Muslims of al-Andalus and to protect Christian pilgrims. Jewelry with the shell shape of the Cross of the Order of Santiago, particularly in pendants, appears in various materials ranging from enamels to diamonds; see Arbeteta Mira 2003, nos. 138, 139.